No-one likes a dirty daddy, so here are the best masculine body washes, currently worth getting in a lather over. ‘Irish Leather Body Wash’ by Memo Paris, GBP 44 for 250 ml, available at Harvey Nichols. This is the iconic fragrance of Juniper, Green Mate Absolute and Leather in body wash form. ‘Shower Oil With Almond’ by L’Occitane en Provence, GBP 19 for 250 ml, available at L’Occitane, Feel Unique and Debenhams. This Shower Oil is heaven sent for sensitive skin as it combines a moisture rich formula with a wonderful fragrance of fresh Almond. 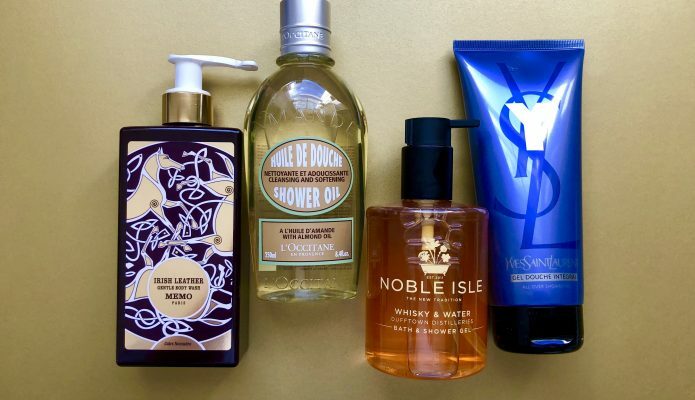 ‘Whisky & Water Bath & Shower Gel’ by Noble Isle, GBP 20 for 250 ml, available at Noble Isle. This shower gel is packed with vitamins and minerals and has a winning scent of Cedarwood, Orange Blossom and Amber. ‘Y Gel Douche Integral’ by Yves Saint Laurent, available at around GBP 26.50 for 200 ml at Feelunique, Debenhams and John Lewis. Main notes are Geranium and Amber. This two- in- one product will help you to serve voluminous hair AND moisturized skin while energizing you up with its singular scent. Simply seek these out and soap yourself up…or just get gifting!